David Caine's latest project lands him in Virginia, in what's aptly named the Alexander House. The task is simple and familiar; to disprove the presence of spirits whilst documenting his findings for publication. As the mystery begins to unravel, David discovers that the house and nearby Rappahannock River share a meaningful part of his own history, as well as possessing a horrific one of its own. I’ll just come out and say it; I didn’t love this book. With all the glowing praise that’s been saturating social media, I expected to be blown away, or at least highly impressed, but I just wasn’t in the long run. Of course, as with anything and everything I read I’m going to try and express my thoughts as best I can, and understandably, there will be spoilers. First of all, the beginning struck me as intriguing - there were all these elements that seemed unrelated yet no less interesting in their own individual ways, but the strength of the start waned as something in particular became apparent the further I progressed. It was the bizarre interactions between characters that just seemed off and left me scratching my head. I just didn’t understand the confrontational approach of nearly every single new person in David’s life; for no reason that I could discern they treated him poorly and judged him considerably. The dialogue seemed almost forced and contrived, as if the sole intention was to leave him a sputtering mess, and rather than finding humour in the derision, I instead felt a monumental amount of confusion. I often wondered if it was merely the fact that he was a successful man, or even just because he was a skeptic, but whatever the case, I believe Janz didn’t at all clarify or explain why David was supposed to be so unlikeable in the first place. The supernatural aspects were entertaining, but I can’t say they instilled fear or dread within me. Whilst the history surrounding the peninsula proved compelling, by the end I regarded everything as a bit too much. Considering how rife the paranormal activity was, I was surprised David had never before experienced anything like it in his entire career; he activity hunted for such encounters, and they weren't subtle here, but full-on in your face with outright corporal madness. There were multiple entities at once, and they were the opposite of shy and insubstantial, so it was hard to swallow the premise overall. I know I have a lot of complaints, and I'm clearly in the minority when it comes to this beloved book. Janz is a good writer, otherwise he wouldn't be as successful as he is right now. 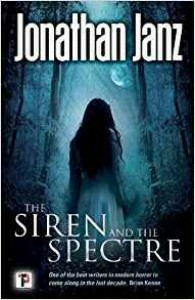 He was able to include some suspenseful scenes laced with the depravity of a town's gruesome past, which I welcomed, but ultimately, it comes down to The Siren and the Specter just not being my sort of story. Though the notion of a house having a personality was antithetical to his beliefs, he did like to think of a house as possessing character. A home's character, he'd decided long ago, was best discernible in natural light, not a harsh electrical glow.